In Audrey Heller's playful photo, a miniature explorer enters a cave of fish-shaped crackers. 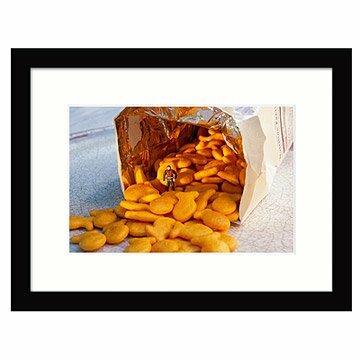 Here, a brave spelunker takes the plunge through an oceanic cave of fish-shaped snacks. "I always dreamed of being a diver with Jacques Cousteau," Heller says, "I am fascinated by the worlds all around us that seem to be modeled on unlikely fantasy." Made in San Francisco, California. Framed in Portland, Oregon.